A month or so ago, Little Lady came home from school with a book she'd chosen from the school library. It was called "Made By Me " by Jane Bull, an author we already know and love. She was very excited by this book and spent day after day reading it cover to cover. She took it to bed with her. She made notes from it. And finally she declared that she really, really, really wanted to learn to knit. More than anything in the whole wide world, she wished to knit. Truthfully I was not too keen on the idea of attempting to assist her with knitting. Knitting is quite a long way out of my creative comfort zone. I'm not very experienced with the sticks. Hooks yes. But sticks? Uh-uh. Well that's to say that I can knit, and indeed I used to knit a lot as a teenager. I used to knit myself gloves and jumpers and although I cannot quite believe it now, I once knit a cardigan for myself with a cable running up the front. A cable!!! Me doing cabley things with knit sticks, it seems incredible! Now as well as knitting, this book also covers embroidery and sewing and has some really sweet projects in it. The sewing pages are a true delight :: beautifully presented and very inspiring. I loved almost every one of the sewing ideas and would have been thrilled if LL had chosen one of them to have a go at. In fact I even tried to persuade her in this direction by buying her a small bundle of coloured felt squares from a local shop. I enthused a lot about the pretty things she could sew for herself. But to no avail. It was knitting that she had really, really, really set her heart on. Her desire to learn and her wonderful enthusiasm won me over in the end, and I made her a promise that I would help her learn to knit. I managed to find some small childs knitting needles in a local shop, and we were all set. We would start out making a small knitted purse, just like the ones on page fifty six. The book has some very good step by step instructions and photographs to explain it all, and without too much trouble we learnt to cast on. When it came to the business of actually knitting I found that amazingly I still remembered how to do it. So between the book and myself, Little Lady was taught the basics. She is a fast learner, and before long she was confident enough to do it without my help. We spent a truly fabulous morning together :: it was half term holiday and J had taken the boys out for the day leaving us girls at home to do girly yarny stuff together. I was working on The Secret Project (no word yet on when I'll be able to ta-dah that with you, am still waiting for News), and Little Lady was fulfilling her Greatest Wish. I wish you could have seen her, heard her, witnessed the pure joy as her little bit of knitting grew and grew. She kept saying over and over that she couldn't belieeeeeeeeeeeeeeve she was Actually Knitting. I was completely thrilled for her. And I was perilously close to tears...you know how some moments in life seem to become unexpectedly MonuMENtal, even though in essence they are so little? This was one of those big little moments. Little Lady and her knitting were inseparable for a while. She did it last thing at night and first thing in the morning. She took it with her everywhere and she worked row after row of pretty good knitty. I hoicked back a dropped stitch from time to time, and sorted out some mysterious extra stitches that appeared, but mostly she just managed to do it without help and I felt so proud of her! Over the past month or so, she worked steadily away at it and we kept on measuring as it grew. It began to get very exciting as she neared the end. Then on Saturday afternoon, she sat on the sofa and declared she would knit four more rows and then it would be Ready To Stitch. The stitching up of the purse was fun, and she did most of it herself. She stitched on a button, then made a little "finger crochet chain" to form the button loop, then whhhoooooooped with delight when she realised she'd finally finished!! The little purse is well loved and well used, it's been much showed-off and much admired. And it's the perfect size for holding her lip gloss. Cool. So that's the story of how Little Lady learnt to knit age six and three quarters. She's already started her next project (a little blue owl, a present for Daddy to brighten up his work desk). How old is your daughter? My eldest duaghter is 6/7 year old and this summer she wanted to start and she got a bit done. I'm worried its a bit too soon, so not pushing her, but she seemed to enjoy it. Liked your site. Looks like simple but awesome. Please keep this to update! Thats brilliant such tidy knitting bless! I absolutely LOVE this website!!!!!! oops! sorry for duplicating my comment, i thought the first one hadn't worked (i'm such a technodweeb, doh!). hello Lucy and your lovely young lady. 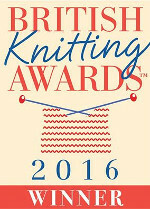 this is a super project and very sound advice too ;o) i am soooo looking forward to the next knitting adventure. i hope you Attic peeps are all having a lovely holiday! hello Lucy and your lovely young lady. this is a super project, so very well made and very sound advice too ;o) i am soooooo looking forward to seeing the next one. i hope you are all having a fun holiday! Lovely results thought, I bet she is SO proud! Hi and Congrats to LL for learning to knit and doing a good job! I was going to suggest that she start with a knitting block or mushroom but it looks like she is way beyond needing those. I still have yet to learn knit or crochet, but if I do decide to learn knitting, it will be with a knitting block for me! I am so pleased for her Lucy! It made you feel like crying...? I sat and blubbed as I thought how wonderful it is when our children are amazed and delighted by things that they can do. The extreme welling up of happiness and love I feel for my daughters at those points just can't be contained! It's such a shame that we become so used to things around us that that amazement and delight seem to dry up as we age. Oh I'm sat here reading this post with tears in my eyes!! Im just learning to crochet *Gulp* and have made a yarn bag as i was so inspired by you!! This is so sweet and lovely. You've brightened my day right up! I remember my grandmother trying to teach me crochet at a young age - I broke one of her hooks clean off somehow. I like to think she sees me knitting and crocheting now and smiles down on me from above. Love.. Love ... Love it! How precious! Hi Lucy, I just found this and HAD to show it to you http://www.cottontailsbaby.co.uk/product/moulin-roty-sewing-suitcase a bit expensive but SO LOVELY don't you agree? A chip off the old block, you must be so proud. Tell little lady well done from me and I look forward to seeing her at the shop. Lucy , I remember how my lovely grandma helped knit when I was five and how my mistakes were magically fixed overnight. Hand made and home made are the best presents of love. Well done LL & Lucy, my bookclub at work is selling this book for a very reasonable price...so I may get it on both your recommendations, and squirrel it away for Christmas - little lady is only 6 and a quarter, I think the half a year or so will make all the difference in her concentration :). Look forward to seeing LL's next creation. After reading your blog I ordered the Made By Me book and when it came was so pleased. How I wished that this book was around when I was a young girl. My grand daughter keeps asking me to teach her to knit but since she's only just 5 I'm trying to hold her off till she's a bit older so she doesn't get discouraged. We are going to go over the book together when I first give it to her and maybe she will find another project that she likes better for now. Your little girl did a great job with her first knitting project. I too love your blog!